Above Standard 2 Bedroom & Loft & Three Bath Town home located in the Scenic Meadow area of Mammoth Lakes. Sleeps up to 8. (approx. 1300 sq. Ft.) You enter the unit on the first floor which is both bedrooms and 2 full bathrooms, the second floor is the living room, kitchen, dining room and 3rd full bath and the third floor is the loft (open into the living room by a half wall). The master bedroom has a king bed, the second bedroom a queen bed, the living room has a queen sofa bed and the loft has 4 twin beds. 4 TVs (Large Flat Screen in the Living Room, a flat screen in the Master Bedroom, 1 regular TV in the second bedroom & a flat screen in the loft),Blu Ray Player and sound system, VCR/DVD players. Wifi Internet Access in the unit. No phone in unit. Upgraded Kitchen with custom cabinets, granite and stainless steel appliances. New Carpet, Slate and Wood flooring installed summer 2011. Summer of 2017 the master & upstairs bathroom/showers have been completely remodeled. The entire unit has also been upgraded with wainscoting and custom woodwork throughout. There is a very nice view of Mammoth Mountain from the Living Room Deck. 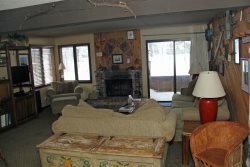 This comfortable unit has been tastefully decorated with Mountain Cabin Style furnishings and decor. There are a maximum of two outdoor parking spaces available. Snowflower Features a Hot Spa and Sauna, Summer Only Swimming Pool, and Tennis Court. Coin-operated laundry facilities located in the common area near the office. There are no Buses, Motorhomes, Trailers or any type of Towed Vehicles allowed on the Snowflower property. COMPLIMENTARY INTERNET and DIRECT TV are provided, however NO REFUNDS will be given for connectivity problems or Internet failure. It was a late minute plan for Mammoth Mountain trip on Memorial Day Long Weekend. We booked this vacation rental on very reasonable price from airbnb. Overall we are very satisfied with the homestay and location is great. I would recommend this place as a good place to stay on vacations. The place was FANTASTIC! Lots of space. My co-workers and I had a great time. Wed stay there again in a heartbeat. Very nice place and we enjoyed our stay. Perfect for our family. We enjoyed our stay in the condo and it was very nice. We also experienced all kinds of weather the day of my sons wedding we had wind, rain, hail, lighting and then woke up to a dusting of snow. So I would have to say our first experience in Mammoth Lakes was very interesting.